“You were always very thoughtful,” Wyatt said. “Not always.” Her mind darkened with the memory. This was a night for regrets. Her whole being, heart and soul, leaned in to him, hoping beyond hope that there was something more. That he would tell her this wasn’t just about Matty. Her heart dropped like lead. He paused and reached for her, framing her face with one hand. His work-worn hands were scratchy against her cheek, but Carolina thought she’d never felt anything nicer. The chemistry ricocheting between them was infinitely familiar and yet paradoxically brand-new. They weren’t the same people they had been three years ago. They had both changed. Matured. 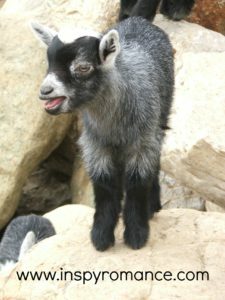 They had a son now. I hope you’ve enjoyed this little peek into my book. I’m going to be giving one copy away to a random commentator who answers the question: What was the last contemporary romance you read that truly grabbed your heart? 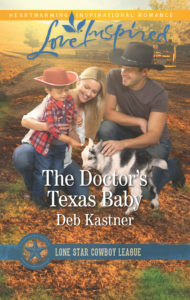 THE DOCTOR’S TEXAS BABY is available now online and wherever Harlequin books are sold. Sounds like a good story. I actually just finished a story that really grabbed at my heart- it was called Armor for Orchids and is a powerful story of forgiveness, love and God’s power. I’ve never heard of that one. I’ll have to look it up! I had no idea the series continuity are plotted and outlined by the editor…very interesting, Deb. Thanks for sharing the excerpt…I enjoyed it! It’s a whole different kind of challenge, Jill. The characters and plot are all done by the editor! Sounds great. Adding that one to my list. Generally the book I’m reading currently grabs my interest. Especially if it is inspirational romance. I’m with you, Diana. When someone asks me which is the favorite book I’ve written, I generally feel it’s the book I’m working on now! Thanks for sharing the excerpt, Deb! Sounds like a great story. A great love story of parents as they face what life throws at them. Thanks for the exerpt. It’s in my TBR list. As for the last book that really grabbed my heart, I’d have to say Finding Love in Big Sky, Montana by Angela Ruth Strong. I started reading hoping for a light read and ended up really engaged in the story and crying with the characters’ pain and love. Awesome! Sounds like a great book! I read Blue Columbine and it’s a story that dragged out all you emotions. I thought it was a great read. I’ve never heard of that one, Colleen. I’ll give it a look. I just finished Because You’re Mine by Colleen Coble; loved it!! I am so anxious to read your book, Deb. Walmart sold out before I got there! Keep up the great writing; have had you in my prayers and hope all things are better. That’s on my TBR pile. Glad to hear a positive endorsement. I’ll have to bump it up higher. Thanks for your prayers. Our family has been through the wringer the past six months in so many ways. Prayers are always appreciated. I loved Maybe It’s You by Candace Calvert. I really enjoy her books. Your story sounds wonderful! Thanks for sharing your time and talents! I love Candace’s covers and have always wanted to read one of her books. I’ll put it on my TBR. I’m wanting to collect every one of the Lone Star Cowboy League: The Boys Ranch books ever since I’ve read Jessica’s installment “The Ranger’s Texas Proposal”. She had me hooked! Thank you for the chance to win yours Deb, I’d love to win it! I think that’s one of the most wonderful benefits of a continuity series. If you already read one of the authors, you may find some other favorites by reading the whole series. Jessica is wonderful! The Hero’s Sweetheart by Cheryl Wyatt. I’ve not read any in The Boys Ranch series, but would love to. They all sound like great books! I love Cheryl’s books! She’s an awesome writer. Susan is one of my favorite suspense authors. Great, isn’t she? My last read was The Hero by .Donna Grant. Thanks for sharing on this blog today!! I looked that up and it looks awesome. Love alpha heroes! I absolutely cant wait to read all of these!!!! I absolutely can’t wait to read all of these!